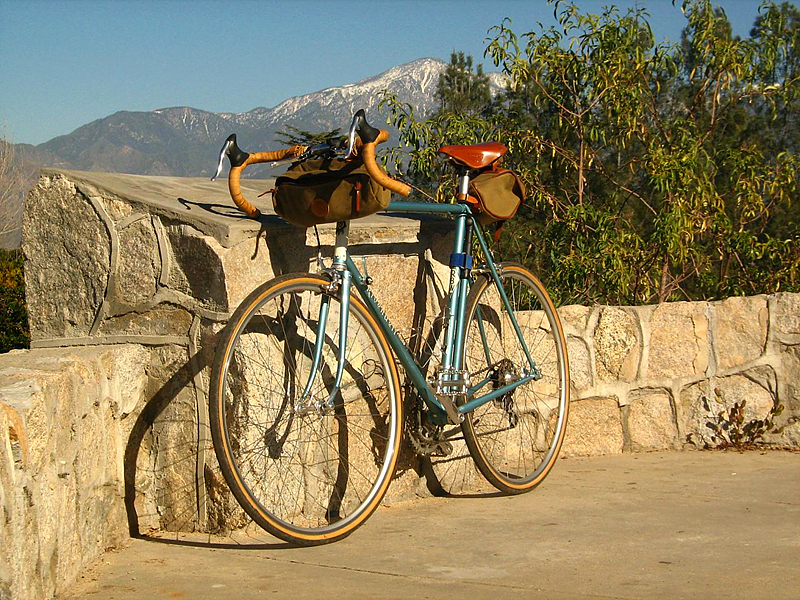 One of the more prolific photographers of "ride shots" has got to be Cyclotourist - aka Dave in Redlands. He's one of the few folks who has actually made me mildly nostalgic for the winding fire roads in the Southland (that's the greater Los Angeles area, for those of you who aren't familiar with the term). If you haven't run across his images on Flickr, you owe it to yourself to follow his stuff. He's also managed to put together some very appropriate bicycles - finding some truly pristine examples of early Rivendell models. Here, he shares his Road model. The "Road" was made during the first generation of Rivendell models. I'm currently developing a bit better documentation of bicycles from this period. The Road model arguably became the branch which begat the Rambouillet/Romulus, then the Hilsen. At the time the Road model came out, finding decent reach brakes was an exercise in NOS patience - the commercial offerings were pretty minimal. But, even so, this bike was spec'd for maximum clearances with the components at hand, and staked out the idea of good clearance, stable and versatile "road" bikes that didn't need to stay on pavement.